Listen, I know what you’re thinking, “wow, one of the kitchens is really slacking this week…..” But you know how it is! Life gets in the way sometimes. The funny thing is, I made my mushroom meal last Friday but alas, life got busy and I now finally have a minute to sit down and share it with you all. Enough excuses though, here’s the deal – this pizza is amazing. If you’re anything like me, you absolutely love mushrooms and are finding ways to sneak them into everything you make. So why not a deep dish pizza!? 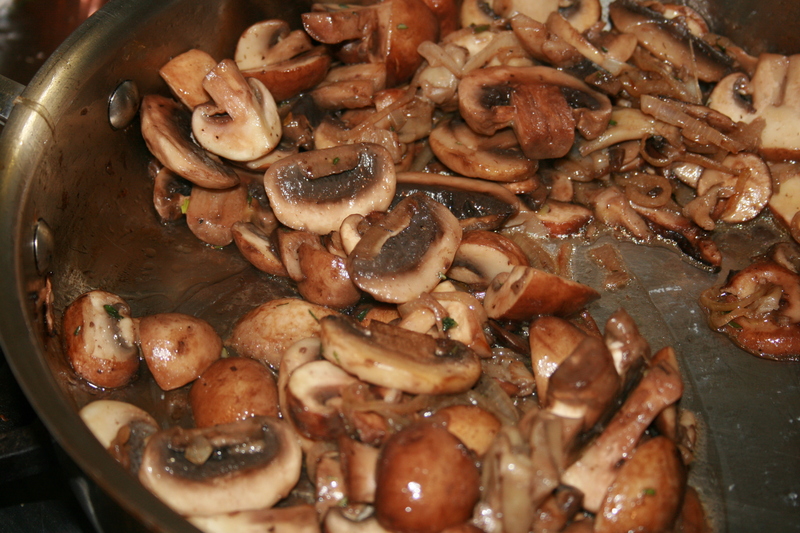 First, preheat the oven to 400° F. Sauté the mushrooms and shallots in butter and olive oil until they brown. Season with the rosemary, thyme, salt & pepper. Coat a 9-inch oven-proof skillet with 1 ½ tablespoons of olive oil. Press the dough into the pan, covering the bottom and sides. 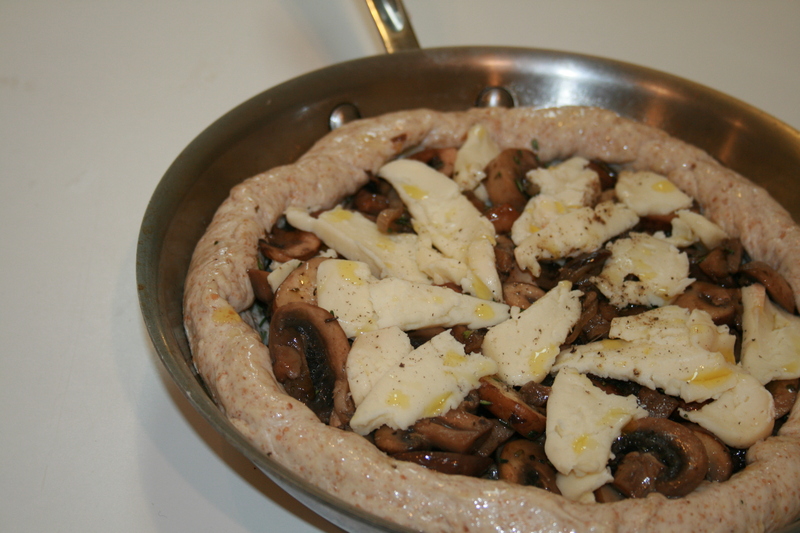 Top with the mushrooms and then the taleggio and just a sprinkle of truffle oil. I then rolled the edges in to get a nice crust on it. I brushed the dough with some olive oil and a touch of salt and parmesan cheese. Bake until the crust is golden brown, 30 to 35 minutes. The hearty mushrooms, creamy taleggio, salty parm and just a hint of truffle makes this pizza absolutely intoxicating. I paired it with arugula greens tossed with a little salt and olive oil for a peppery zip. Yum. 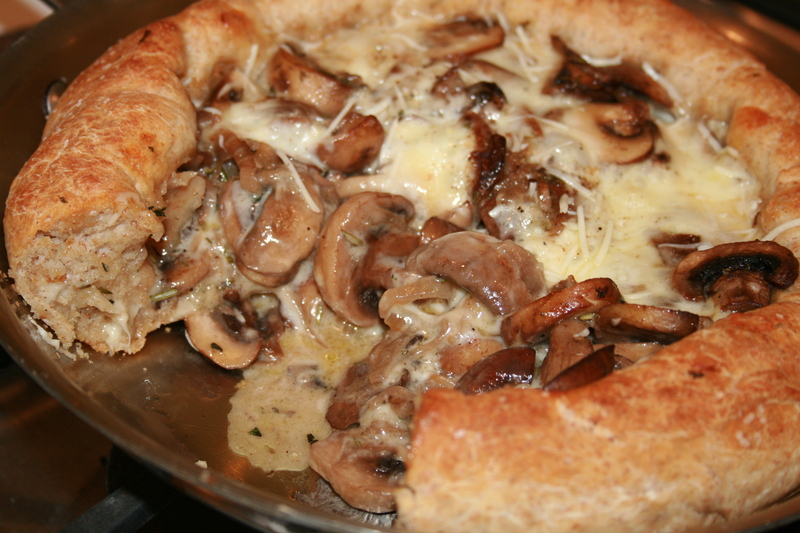 This entry was posted in Mushrooms and tagged mushroom, parmesan cheese, pizza dough, rosemary, shallot, taleggio, thyme. Bookmark the permalink. This is torture to look at!! I WANT SOME!!! !